“Saying Goodbye to someone who you care and love is extremely difficult and hard. The funny thing is that you never appreciate what you had yesterday until it is gone today.” Thus comes the farewell day for the very first batch of Grade XII of Vydehi School of Excellence on 19th January 2019. The theme of the valedictory party was “GO FORTH AND CONQUER”. 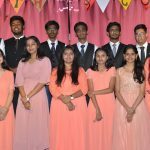 The programme consisted of an amazing display of dance, music and mime performances followed by the felicitation of the outgoing batch. The gracious presence of Mr. Harjeet Kakkar,CEO of Vydehi Group of Institutions made it even more memorable. The party started with inspiring messages from the honorable CEO- Mr.Harjeet Kakkar, Advisor Ms. Laly Mathew, Principal Ms. Sinia Sajith and wonderful speeches by Grade 12 students. The highlight of the evening was the video with memories of each student, their parents, teachers, coordinator, principal and advisor of the school. The feelings of the students were expressed by each one of them, making the entire crowd go emotional but the DJ Platform and delicious food completed the function with a happy ending and a memory which can be a lifetime achievement for each one of them. The day was a fiesta devoted to the years spent together with friends and teachers to reminisce joyous moments.